Steam Punk Heroes is a mystic video slot game coming from Microgaming. The slot has an overall dark tone with beautifully designed game symbols. The animations used in the game are on a decent level and contribute to the overall attractive design of the slot. As you spin the reels you get a feeling like you are playing some popular PC action game. This makes the game play even more fun and exciting. The wild symbol in Steam Punk Heroes has a simple design as a Wild Logo symbol. He can land on all of the reels and will substitute for all of the symbols except the scatter symbol. He comes with a maximum payout of 2.000 coins for 5 of a kind wins and will also double any payout he contributes in. 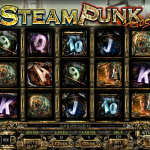 The slot also has a Scatter symbols which is the Steam Punk Heroes Logo. The scatter will award a maximum payout of 50 x stake for 5 of them on the reels. More importantly the Steam Punk Heroes Scatter will trigger the Free Spins bonus round when 3, 4 or 5 of them land anywhere on the screen. Before the free spins start the player is taken to a separate screen. Here you will see two gears and you will need to pull each knob to make the gears spin. The first gear will award a random number of free spins, while the second awards a random multiplier number. Players can win up to 20 free spins which are played with a multiplier of up to x10. If the feature is re-triggered the player is returned to the gears screen after the regular spins are over. 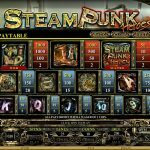 Steam Punk Heroes is a great Microgaming slot which can produce massive payouts in the free spins bonus. If you score the highest x10 multiplier all payouts with a wild will have a x20 multiplier attached thanks to the doubling function of the wild symbol. If earth is not enough for you then try playing something that takes place in outer space: Starscape a 5 reel slot by MicroGaming.